Schneider's Sweet Shop and chocolate factory are located in Bellevue, Kentucky, just across the river from Cincinnati, Ohio. Founded in 1939 by the Schneider Family, Schneider's originated as an old-fashioned neighborhood candy and ice cream store. 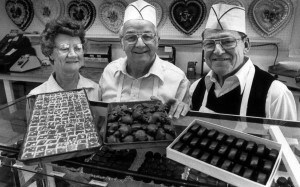 Since Robert Schneider was the only experienced candy maker in the family, he and his wife Lill took sole ownership of the business shortly after it opened. Using his years of experience, time-tested recipes and only the best quality ingredients (taking no short cuts! ), Robert's reputation and Schneider's soon flourished. In 1986, after almost fifty years in the candy business, Robert retired. Robert's son, Jack, who worked beside his father for twenty years, took over the family business with his wife Kathy. Jack and Kathy have carried on Robert's theory that customers want and deserve quality. To retain that old-fashioned quality and freshness, the candy at Schneider's is still made the same way with the same tried-and-true recipes. Click here to read the story about us on Cincinnati.com!